In one of his fantasy novels, C.S. 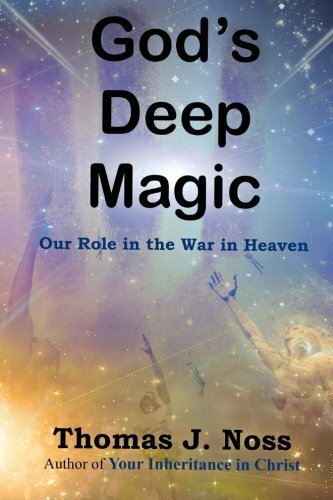 Lewis crafted the term 'deep magic' to represent the ancient, secret laws that apply in the real conflict between Almighty God and His adversaries in heaven. C.S. Lewis symbolically represented the ancient laws of the spiritual realm; but God's Deep Magic is about the real laws of the celestials’ realm. - What is God's purpose and plan of the ages? How will it be accomplished? - Who are God’s adversaries in heaven? - Who are the celestial ‘principalities and powers’ the Apostle Paul said we wrestle against? - What is the origin of evil and the Devil? - What is a human? Where does each person’s spirit come from? Why are we all naturally prone to make sinful choices? - Why did God create mankind, knowing Adam would sin? - Why hasn’t Jesus returned yet to set up His millennial kingdom? The Church Needs Fresh Answers! While most Christians are familiar with traditional, cliché answers to these questions, truly Biblical answers will often challenge your existing beliefs and behavior. For almost 2000 years the Church has been wandering like Israel in the wilderness. Today's Laodicean Church thinks it’s wealthy and has need of nothing. But, Jesus warned the Laodiceans to buy gold from Him, refined by fire, so that they may become rich, and to be clothed with white garments to cover their nakedness. Now, at the end of this eon in God’s plan, it’s time for us to leave the wilderness, following the Spirit of Yeshua into our promise land, with character refined like pure gold, walking in the fullness of the stature of Christ. This book unveils the war in heaven—ongoing since the eon before God created Adam, and the role of today’s Christian Overcomers in God’s imminent victory. In God's Deep Magic you'll learn these things from the Bible: - Who are God’s enemies? - Who are the principalities and powers in heaven? - When and why did their war in heaven begin? How does the war in heaven affect mankind? - What is the destiny of the principalities and powers? - If God is Almighty, why doesn’t He simply squash His enemies? What's He waiting for? - What happened before God re-created the earth? - What is God’s purpose in creating mankind? - What really happened at the Tower of Babel? - How and why did 70 archon principalities get authority to rule the original 70 nations of the world after Noah’s flood? - What are the eons of time in God’s plan? Where are we today in this timeline? - What is the ‘court in heaven’ the prophet Daniel refers to? - Who are the ‘cloud of witnesses’ in Hebrews 12:1? What do they testify to? - What about Lucifer, Satan, the Serpent, the Great Dragon, the Devil? What is the origin of Satan? Who or what is Satan? - How to overcome Satan. - What is a human? How do the human spirit, soul, and body combine to make a human? - Where does the human spirit originate? - Why are we born with a sinful nature? - What is the Overcomer's role in the climax of God's plan? - How can you overcome sin and shame, and be holy, without any consciousness of sin and shame? - How can you become an Overcomer in the kingdom of God? You can understand WHAT God is doing now, in the last days of this eon, WHY He is doing it, and what YOUR ROLE is. God’s Deep Magic exists to teach, inspire, and motivate you to become an overcomer in God’s Kingdom.